Shahar Markus's works combine the mediums of performance, video and sculpture, and make use of organic, biodegradable materials. 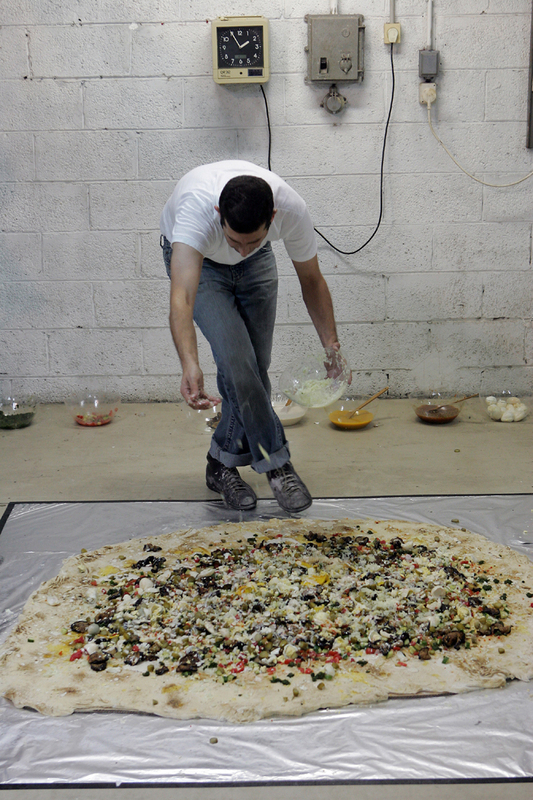 In this work, he documents the preparation of a gigantic portion of the Israeli street food known as Sabich, and scatters its components on a giant pita bread laid down on the floor. His bodily gestures are reminiscent of a Native-American ceremony or of Jackson Pollock's action paintings: the dripping sauces replace Pollock's paint drips, and the artist's hands stand in for the brushes. The sublime character of Abstract Expressionism is thus transformed into a vernacular, bodily, down-to-earth activity. This work, which is suffused with humor, undermines the self-important myth of the artist, and absurdly blurs the distinctions between the creative process and an everyday Israeli experience.